After the destruction of the Second Temple, nine hundred Jewish zealots hold out against a five thousand man Roman legion on the mountaintop fortress of Masada. Senator Pomponius Falco: [arriving in camp during the heat of day] So much for atheism! There is a Hell! This is it! One of the best mini-series ever! This is quite simply one of the grandest epics you can see. I first saw this on TV when I was young. Every night it was on I was glued to the TV, completely enthralled by the story. When I finally got the multi-tape set recently, I wasn't sure if I would still be affected the same now that I am older, but it was everything I remember. Fabulous story. Fabulous actors.Incredibly moving musical score. 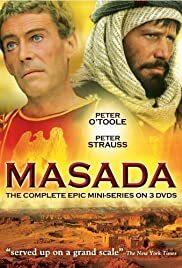 Incredibly realistic set because it was actually filmed at Masada. The whole thing was just breath-taking. And the story is so powerful it will have you walking around for days just weeping from the emotions it brings out. If you can find the 6 1/2 hours to sit down and watch it in one sitting, you will not be disappointed.